At an event in London today with TechRadar in attendance, Freesat revealed that it wasn't taking the threat of YouView lying down by introducing its latest Freesat+ box. Compared to previous boxes, the next-gen Freesat+ box offers similar functionality as Virgin's TiVo box but with the added bonus of being subscription free. The box comes with something called Free Time. This is a backwards EPG, which offers content that has already been shown on TV. Through Free Time you can go backwards through the EPG and choose to watch content on-demand. This functionality is similar to what YouView and TiVo both already offer. There's also 'at a glance' Now & Next view on board, inmproved recording, On Demand TV from BBC iPlayer and ITV Player with 4OD and Demand 5 launching before Christmas, and a Showcase section. Speaking about the new Freesat+, Emma Scott, managing director of Freesat said: "Over 2.6 million Freesat boxes and TVs have been sold. "Over half of UK homes don't pay to watch TV and we believe in the choice of subscription-free TV. "Our new box uses open standards like HTML5 – the technology of the web is coming to set-top boxes and this should mean lower prices over time and more choice for consumers. 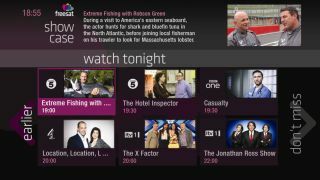 "We have developed a smart new TV guide that lives inside the next-gen of Freesat boxes. It allows you to go backwards and offers reccomendations of what you should watch. "Our new guide makes watching TV better – it is called Free Time." Although it was rumoured that Freesat was partnering with Netflix, this wasn't actually mentioned at the event. Scott did hint that pay TV services were coming to Freesat. however. "We have always indicated our interest on-demand pay service," Scott noted. "It is important that we offer additional, optional choices for consumers." And Scott also said that a Freesat app is on the way, noting: "We are in the process of creating a remote control app for Freesat, which will control your Freesat boxes and will be available for both Android and iOS." The Freesat+ box UK release date is later this month, it is made by Humax and will set you back £279.